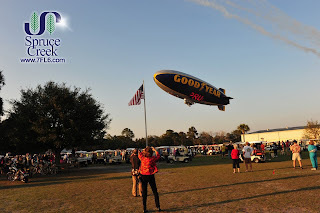 SPRUCE CREEK FLY-IN, FL - The Goodyear Blimp made a visit to Spruce Creek this afternoon. The airship made Several low passes much to the delight to almost two thousand Spruce Creek residents which were congregated at "The Tree" in Windsock Park. The Spruce Creek Gaggle Flight Team joined in a formation flight display with Vans RV-8's and Piper Cubs. The RV8s were piloted by Mike Kelly (lead), John Fleurent, Neal Waldron, Ron Keilin and Bill Merkin, all residents of the fly-in. The LED sign in the blimp was programmed to display "Nice Wheels and Wings..." and "Spruce Creek Goodyear's favorite Fly-In" which elicited the applause of the spectators. Several hundred golf carts, the favored mode of transportation at the famous fly-in, lined Windsock Park. Many of the picnic tables set up by volunteers included delectable treats. The blimp was in the Daytona Beach area as part of a Goodyear promotion for the NASCAR races this weekend and took the seven mile flight to visit the world famous Spruce Creek Fly-In. The annual Daytona 500 race is to be held today. The Goodyear Blimp is the collective name for a fleet of blimps operated by Goodyear Tire and Rubber Company for advertising purposes and for use as a television camera platform for aerial views of sporting events. Goodyear began producing airship envelopes in 1911 and introduced its own blimp, Pilgrim, in 1925. All three of the craft are outfitted with LED sign technology Goodyear calls "Eaglevision." This allows the aircraft to display bright, multi-colored, animated words and images. According to the Goodyear website, the three active GZ-20 blimps are 192 feet (58 meters) long, 59.5 feet (18 meters) tall, and 50 feet (15 meters) wide. Typical cruising speed is 35 mph in zero wind. Top speed is 53 mph on the GZ20. Maximum range is limited to around 900 miles, or twenty-four hours without refueling. However, cross country ferrying are usually limited to about 300 miles per day, usually amounting to up to eight hours of flying. Goodyear also has blimps operating in other parts of the world, including one in China. These airships are built and operated by The Lightship Group of Orlando, Florida. The blimps are filled with helium. The helium is maintained under low pressure, so small punctures do not pose serious consequences for the blimp. In fact, one inspection element of the blimps is to look into the envelope for pinpoints of light which are indicative of small holes. The blimps have infrequently been hit by small-arms fire from the ground. Also, birds can hit blimps and make small beak holes. These incidents have not resulted in any serious consequences to the blimp or its crew. The blimps are equipped with internal bladders in the envelope, and as the blimp ascends or descends these bladders expand or contract to compensate for density changes and to maintain uniform pressure in the envelope. For safety reasons, the average lifecycle of a blimp is around twelve years. After that time the neoprene-impregnated polyester fabric that holds the helium is retired.